Silver Mountain Hay Barn inside, originally uploaded by jahansell. 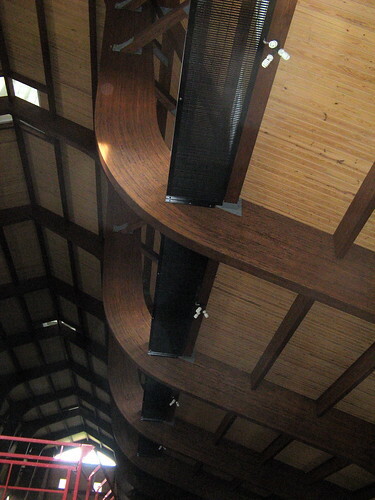 These supports are 75 feet high of continuous wood - made from dozens of pieces pressed together. It's hard to convey the majesty of the space! Here is a much better photo and interesting background, from the manufacturer of the beams. This might be a stupid question, but why would someone spend so much money on a hay barn? Good question Terry - I have no idea what his motivations were. If you are building a barn wouldn't you want to build the best barn you could? Why does anyone build a building more grand and beautiful than strict utility and function would require? If it were housing something valuable, then investing lots of money in the structure would make sense. But hay is as cheap a commodity as you can get. Maybe these people just have a lot of money and aren't really interested in recouping their investment. couple thoughts....if ya got the bucks, and ya want it to be spectacularly well built, a show piece, then, hey,(no pun) ya go for it..... also> hay is not cheap. Fill this size of barn with quality first and second cutting, and you have a retail return that could be anywhere up close to a million I bet. This thing is so large..I bet it will hold 50,000 bales, maybe a lot more. Multiply times 6,or more dollars, well it suddenly becomes a possible big return....And I am just guessing what it will hold... Would love to see it up close. drove by once and about drove off the road! Rick, even if hay isn't so cheap anymore, you still don't need a such a spectacular structure to hold it. It doesn't make economic sense. Which leads us to your other point. If you got the bucks and want it to be a show-piece, then you go for it.